Significant Other and I are so excited at the prospect of Formula 1 racing starting in 20 minutes that we wolf down most of our Hercule de Charlevoix before we think of taking a photo for the blog. Which explains the only image (above) we have of this wonderful Quebec cheese. L’Hercule de Charlevoix was named after Jean-Baptiste Grenon from Baie-Saint-Paul whose physical strength was said to be phenomenal. Made prisoner by General Wolfe’s troops during the summer of 1759, Grenon was released by the English soldiers who were incapable of controlling the Charlevoix strongman. So the legend goes. Steve Essiembre and Stéphanie Simard of Ferme Stessi with one of their 30 Jersey cows. L’Hercule is a classic firm cheese made with raw milk from the 30 Jersey cows of the Ferme Stessi, a mere hundred yards from cheesemaker Laiterie Charlevoix, The curds are cooked, pressed and ripened, normally, for 6 to 18 months. Our Hercule had been aged a full 24 months and showed it in complexity. 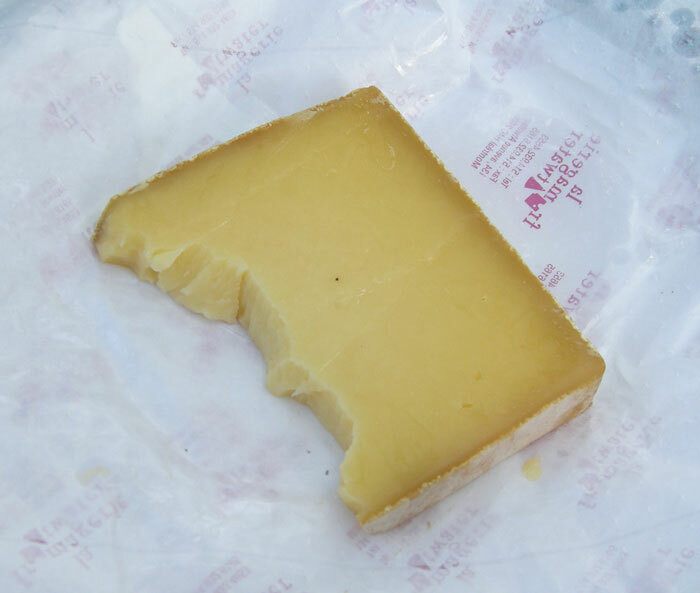 The flavour and supple texture of the cheese gives a nod to such greats as French Comté and Swiss Gruyère. The younger cheese is mild with a fruity aroma and sweet flavour, followed by a tangy finish. By 18 months the aroma is creamier and more complex, and the sharper finish has mellowed to a full, nutty finale that is enhanced by the earthy, toasted flavour of the rind. These traits and its larger wheel size (12-14 kilograms) make L’Hercule de Charlevoix a unique style of cheese in Canada. Our plan was to make the Hercule the only of cheese of this day, but after Lewis Hamilton, boyfriend of Pussycat Doll Nicole Scherzinger, won the Grand Prix we feel the urge to celebrate. Off to Montreal’s Latin Quarter we go where, at La Brioche Lyonnaise, Significant Other has a delightful vegetarian crepe—nicely layered with Emmentaler. After a long day at Circuit Gilles Villeneuve, she is famished and, again, we forget to take a photo. Georgs Kolesnikovs is Cheese-Head-in-Chief at CheeseLover.ca. Thank you so much for enthusiastic hommage to one of Canada’s growing number of spectacular Jersey cheeses! Your comments are appropriate and well-deserved! These rambling notes are written from Jersey where the 2nd World Jersey Cheese Awards have just been held as part of Jersey Island’s annual spring fair/fayre. Obviously you’ll have to consider adding this event to your roster of travels-next again in May or June 2012. Next North American Jersey Cheese Awards late June 2011 in Wisconsin. Sorry for the advertorial but energy and interest surrounding fine Jersey cheeses is rocketing upward! Glad you liked Hercule! BTW Canada-based Kathy Guidi of Artisan Cheese Marketing was a head judge at the Cheese festival and the champion was a spectacular true Blue from Swtizerland-it is truly “to live for”! Travel on Mr. K!! Loving every post. I’m from Montreal and the next time I visit I’m going to buy lots of the cheeses you’ve written about. Bravo!